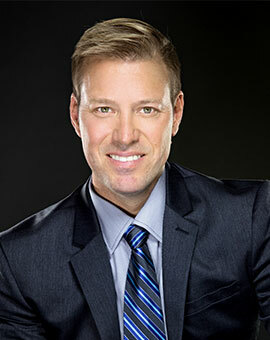 Brad Mainor, Senior Partner, has extensive personal injury trial experience. His professional accomplishments include securing an 11 million dollar settlement immediately after opening statements. Brad has also tried to verdict a 3 million dollar motor vehicle accident, a 1.4 million dollar slip and fall, with only $68k in past medical expenses and has settled numerous million dollar cases. A $5 million jury verdict for a slip and fall at a restaurant, is believed to be the largest slip and fall verdict in Nevada’s history. A native of Las Vegas, Brad graduated from Bonanza High School before receiving a Communication Studies degree from Brigham Young University. While attending American University’s Washington College of Law in Washington, D.C. Brad was chosen to serve on an advisory committee to the Dean and was selected as a Dean’s Fellow. During his legal studies, Brad had the opportunity to represent indigent tenants in court against wealthy landlords. It was during this time that Brad recognized his passion for representing the vulnerable against the powerful. During law school, Brad also worked for Williams and Connolly, one of the most prestigious law firms in the country, whose clients include President Clinton and the First Lady. Brad gained valuable experience working with some of the nation’s finest litigators on matters that were routinely heard before the Supreme Court of the United States. In Brad’s early years practicing law, he quickly distinguished himself as a strong litigator. As a result of several successful jury verdicts for cases he has tried, Brad has been selected as a member of the Million Dollar Advocates Forum which is limited to attorneys who have demonstrated exceptional skill, experience and excellence in personal injury law. Additionally, he has been named one of the Top 100 Trial Lawyers by the American Trial Lawyers Association for the last five years, and has been extended the Honor of Patron by the Nevada Law Foundation. Brad was honored with the Top 40 Under 40 award by The National Trial Lawyers for both 2012 through 2014. He received the Excellence in Practice award for Super Lawyers and was voted in the Top 100 Men of the Year for My Vegas Magazine. Brad was also recognized as the Nation’s Top 1 Percent by the National Association of Distinguished Counsel. He was honored in the Top Lawyers of 2014 by Desert Companion Magazine and was nominated and awarded recognition as a member of the Legal Elite in Nevada Business Magazine. Watch this short video discussing why Brad Mainor practices exclusively on personal injury cases in Las Vegas. Brad also holds a membership with the American Trial Lawyers Association, the American Association for Justice, the Nevada Trial Lawyers Association, the State Bar of Nevada and the Clark County Bar Association. Brad has also strived to increase awareness for injured victims by publishing articles on Avvo.com, including writing the legal guide How to Outsmart Insurance Companies in a Personal Injury Case. He was also featured on the Legal Brief News Network where he discussed how insurance companies use a computer program called “Colossus” to evaluate claims in personal injury cases and car accidents. In his downtime Brad volunteers much of it towards the Las Vegas community and his church. He is fluent in the Danish language having served two years of voluntary church service in Copenhagen, Denmark. He also enjoys spending time with his family, cycling, mountain biking, football and is an accomplished piano player.